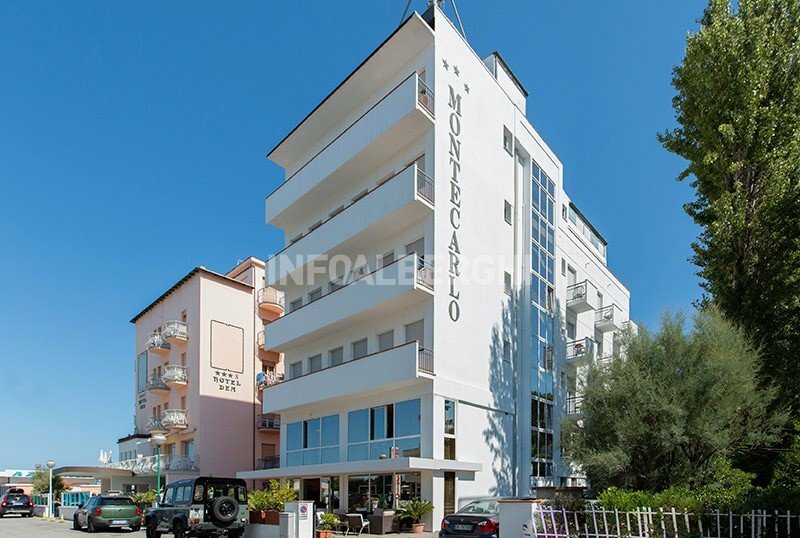 The Hotel Montecarlo , 3-star family-run hotel in Milano Marittima, is characterized by its recently renovated rooms and its location near the sea. Ideal for families with children or for those looking for a comfortable stay, with direct access to the beach. It admits pets of all sizes. The hotel is located a stone's throw from the beach, near the ring park of the Pino and 5 minutes walk from the pine grove. The city center can be reached with a 15-minute walk or alternatively in 5 minutes with city buses, whose stops are close to the hotel. The rooms, recently renovated, have a balcony (most of them with sea view), double glazing, WI-FI connection, LCD satellite and digital TV, electronic safe, telephone, mini-bar on request, magnetic card and bathroom with hairdryer. courtesy set and shower box. Garden, terrace, lift, satellite TV, night porter and laundry service. Theme nights are organized. PARKING: uncovered, available for free until exhaustion. AIR CONDITIONING : present in the common areas. PETS : accepts pets of all sizes. BREAKFAST : international buffet, as well as beverages such as espresso, cappuccino, fruit juice and tea, a wide selection of sweet and savory foods including homemade cakes, brioches, plum cakes, yogurt, cereals and muesli, jams, honey, Nutella, mixed cold cuts, toast service, bacon, frankfurters and scrambled eggs. LUNCH AND DINNER : 3 different menus served buffet front cooking, with traditional Romagna dishes based on meat and fish, appetizers and vegetables. Pasta and desserts are homemade. CHANGES : the menu is suitable for vegetarians and vegan recipes are prepared on request. At meals: table seats, fresh milk, pastries, vegetable soups and broths. The hotel has an agreement with the Bagno 301 beach in Milano Marittima where there is a bar restaurant, a children's playground area, a nursery, a bocce courts, a ping-pong table and table football. The list prices are per person per day for a minimum of 3 nights. - The meals not used will not be deducted from the total cost of the stay.